You finally went out and bought it: your very first reloading kit. As you excitedly begin to unpack everything, you come to the realization that you are going to need a dedicated workspace to keep all of this stuff straight! In fact, almost every press will require a hard surface to mount to. Thankfully, there are quite a few great options out there for the best reloading bench, and they can even be built very easily yourself! If you are looking to purchase a ready-made reloading bench, then you will have no trouble finding one that meets your size and storage requirements. Most reloading benches are going to be pretty similar in their base functionality, but there are a few things to consider when you go to purchase a reloading bench for your own. One of the most important things to consider is the size. You don’t want to buy a bench that is too big for your workspace! You will also want to consider the height of the bench. This will largely be determined by whether you want to reload while sitting or standing. Since reloading is often a time-consuming process, most people choose to sit, but if you have problems with sitting for long periods of time you may want to stand. The final option to consider is going to be your storage options. Drawers, cabinets, and shelves are the most common methods of providing storage on a bench, and each method has its own unique advantages and disadvantages. The first and most important thing to consider when picking out your bench is the size. If you are lucky enough to have as much space as you need for your reloading bench, then you will probably want to get the biggest size possible. Most of us will be limited by space though, so taking precise measurements is very important. You may not think that you will need very much space, but reloading requires a lot of gear and components, and that requires a lot of storage and working space. You will want to get the biggest bench possible that will still fit in your working area. Choosing the height of your reloading bench is another important factor. I will often spend several hours at a time at my reloading bench. Spending this amount of time on my feet can get very tiresome, so I elect to sit at my reloading bench. I find that a reloading bench setup at a regular desk height is much more comfortable for me, and as such, I am able to spend more time reloading before I get tired. This also greatly increases your options for reloading benches. With a sitting-height bench, you could easily re-purpose an old desk or another table. A standing-height bench has its advantages as well. This allows you to be more mobile and utilize much more of your working space. It is also a bit easier to work the lever for your press when you are standing. This can also be a better option if you have back problems or other health issues which prevent you from sitting for long periods of time. Either way, you will want to make sure that the option you choose will be comfortable for you to use for long periods of time. Once you have a good reloading bench that will fit your size and height requirements, choosing your storage is the next most important thing. Reloading your own ammo requires a lot of components and gear, and storing all of them can be a hassle without the proper storage. The three main storage options are going to be drawers, cabinets, and shelves. Most reloading benches will have some combination of the three, but others will limit you to just one type. Some benches will come with no storage at all! In this case, it will be up to you to build or purchase your own storage system. While most reloading benches don’t come with very many drawers, they may be your only option if you choose to re-purpose an old desk. Drawers are a good form of storage for certain components, but you will also need a secondary mode of storage as well. Drawers offer very limited storage capacity and are very easy to get cluttered and full of junk. A big advantage of drawers is that they are sturdy and secure. Many drawers, particularly those on old desks, are lockable and made of very sturdy materials. These can be good for storing some of your more valuable or dangerous items. Things like expensive powder scales and explosive powder are good to keep in lockable drawers to prevent unauthorized access. Shelves are one of my personal favorite storage methods. They keep everything neat and organized and are easy to keep clean. They also offer far more storage capacity than drawers. Shelves keep everything in a neat and organized manner, and everything is in plain view and easy to grab. I don’t have to waste time digging through a pile of stuff in a drawer to find what I need because it’s all right there in plain view. Another bonus of shelves is that they are very easy to construct yourself. 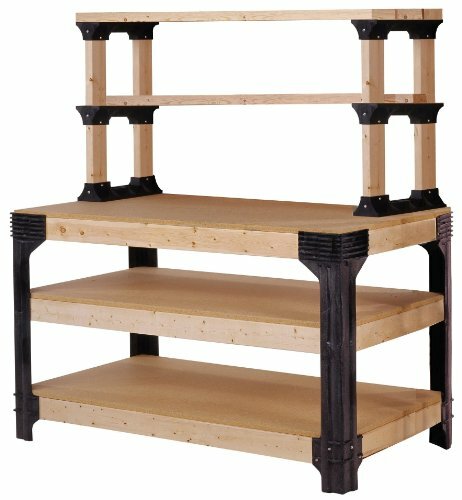 This means that if you elect to purchase a bare-bones reloading bench with no storage, it is very easy to build a quick shelf yourself to put on top and keep organized. The one area where shelving falls short is the security. My reloading room is in the basement of my house and sees very few visitors other than myself. I do not have to worry about strangers poking around in my things, or children getting into dangerous components. Because of this, I have no problem keeping all of my components and gear out in the open where it is easy for me to access. If you are worried about unauthorized access, you may want to consider putting your more sensitive items in a different storage method. Cabinets are an excellent middle ground between shelves and drawers. Many cabinets are lockable, which gives you the security of drawers, but they also have a storage method identical to shelves. If you require most of your reloading supplies to be locked up when they are not in use, a good lockable cabinet is a great option. There are several downsides to cabinets. The first is that they can be much more expensive than shelving. A good lockable cabinet can be built yourself, but it will be much harder and not look nearly as nice. The cabinet doors can also get in the way if you do not have them placed properly. A cabinet that sits directly on the bench will be in the way of whatever is sitting in front of it whenever you open up the cabinet. If you are looking for a good reloading bench, but aren’t quite sure if you’d be more comfortable sitting or standing, then a good adjustable height bench like this SORB reloading bench may be a good place to start. With this adjustable height reloading bench, you will be able to quickly go back and forth between a sitting or standing bench. This bench also features a leveling system to ensure that your bench top can be level on any surface, and the 1.25-inch thick wood top provides a solid surface to mount your press and other gear too. One place where this bench falls short is the storage. It offers a small shelf below the wooden top and another small shelf on top of a pegboard backing. Pegboard, while handy, does not offer very good storage for reloading supplies. If you plan to purchase this bench, be prepared to spend some extra money on some more shelving or cabinets. While the lack of storage space can be a slight issue, this bench makes up for it with all of its other nice features. If you need a bench that is adjustable and don’t mind the lack of storage space, then this bench may be just what you need. 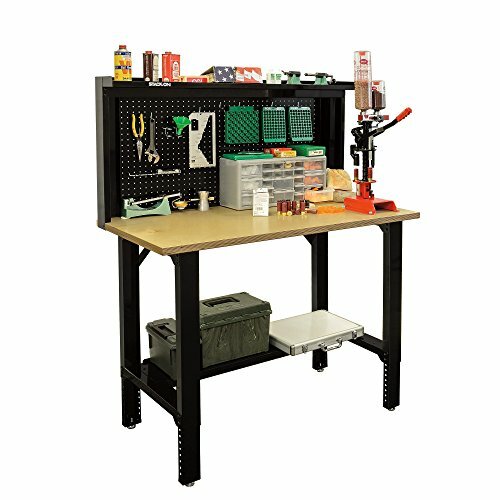 If you are looking for an affordable, quality, no-frills reloading bench, then this basic workbench from Hopkins is an excellent option. This bench is fully customizable in height and length and comes with ample shelf storage to hold all of your components and gear. Each shelf can support up to 1,000 pounds of weight, so it is plenty sturdy to do anything you need. One downside to this bench is that it does require a bit of construction. You will need to purchase and cut to length your own 2x4s, so if you are not very handy or don’t have access to a saw, you may want to consider other options. This bench is also not specifically designed for reloading and lacks some of the features seen on the much more expensive benches. All things considered, this option gives you a very sturdy, customizable bench at a fraction of the price of the other benches. If you don’t mind doing a bit of assembly work and want the payoff of an excellent, sturdy, custom workspace, then this is a great option to consider. If you are looking to get set up to reload in an apartment or other limited space, this small reloading bench from Frankford arsenal may be a good option to consider. It has a sturdy steel frame with a wooden top to facilitate easy mounting of a press and other gear. 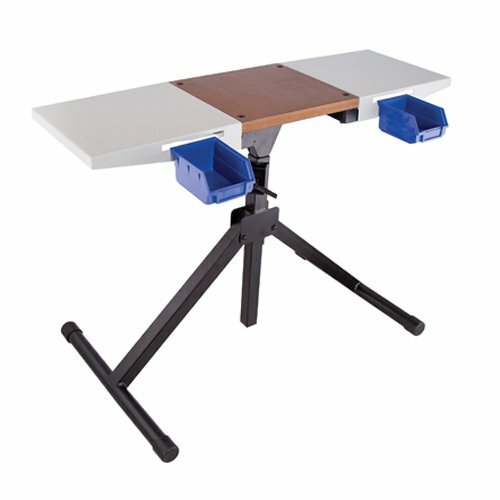 It is also height adjustable and features 2 fold out platforms to increase your working area. It also has 2 handy buckets that clip into the sides, which are excellent for holding completed rounds or other components. As with most small reloading benches, this is not going to be nearly as sturdy or stable as a larger, heavier reloading bench. It also offers a very limited workspace. While this is excellent if you do not have very much room to work with, to begin with, it can be very frustrating if you like to spread out when you work. At the end of the day, if you are limited by space and want the best bench you can get, then you will be hard-pressed to find a better option than this one. It is far from the best option out there, but for those who live in apartments or small houses and still want to reload, this is about the best you can get. 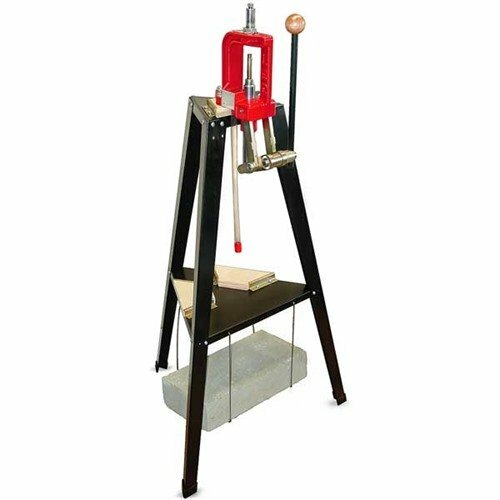 If you are severely limited by space, or simply want a convenient way to have your press close to your bench but not on it, then this simple reloading press stand from Lee is a great option. Since the stand is made by Lee, it is designed to interface seamlessly with other Lee metallic presses and should be able to be mounted with no pesky drilling and minimal tools. The sturdy 3 leg design ensures stability, and the rubber tipped feet won’t scratch or mar your flooring. The main downside to this stand, obviously, is the size. While it does have an attachment for a bucket, this stand provides absolutely no storage space. While this is not a problem if you are using it to supplement a reloading bench, it can cause issues if this is all that you have. All in all, if you simply have no other choice and don’t have enough room for anything bigger, this simple reloading stand will get the job done. If you have enough space to get anything bigger, then that will obviously be a better option but for some people, this may be the best thing you can get. Let’s face it: if you want to be able to reload, you are going to need a place to mount your press. If you want the best reloading bench, you are going to need one that will fit your height and space requirements, as well as being sturdy and having lots of storage. I have provided details for several different reloading bench setups, and while all of them will meet the basic requirements and serve different unique purposes, there is one obvious clear winner. The basic reloading bench from Hopkins is the only one that meets almost every need for the serious reloader, all while coming in at an excellent price point. Now you have all the information you need so that you can get your perfect reloading bench setup today!